Task: Design a keyboard with screens embedded in each button. Each key is a stand-alone display that shows the function currently assigned to it. Optimuss customizable layout allows convenient use of any languageCyrillic, Ancient Greek, Georgian, Arabic, Quenya, hiragana, etc.as well as of any other character set: notes, numerals, special symbols, HTML codes, math functions and so on to infinity. PC with installed OS Windows XP, Vista or 7, with a USB 1.1 (or better 2.0) port; Mac OS X from 10.5.1 to 10.10.5. In order to extend the service life of the displays and avoid using cables that may be vulnerable to wear, the screens embedded in the keytops are fixedits only the transparent caps that are pressed. Every button of the keyboard (or, more precisely, a module consisting of a moving cap, a microchip and a display) can be easily removed to clean or replace. 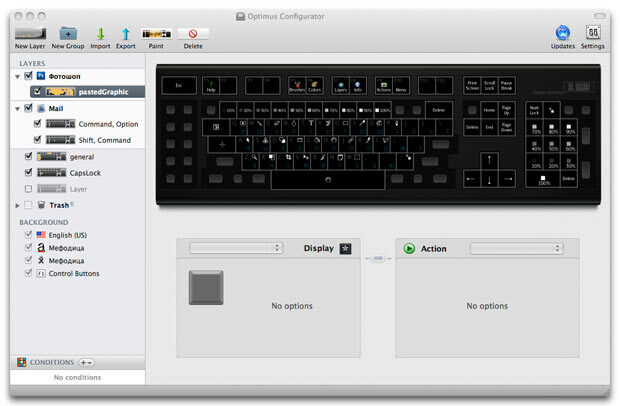 Configurator software enables users to program each button to reproduce a sequence of symbols and edit images separately for each layout.